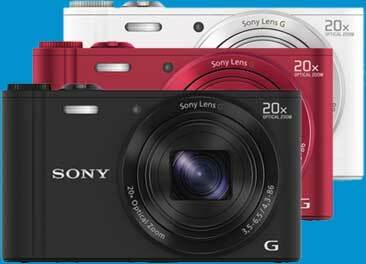 Bring the action ultra-close with a remarkable, 20x zoom ultra-compact camera. Plus, share pics and video easily to Facebook and more with wireless transfer to your smartphone or tablet. Easily shoot all day with battery to spare with up to 500 photos per charge. Zoom in super close for great sports, travel, and wildlife photos. The WX300 boasts 20x optical zoom plus 40x Clear Image Digital Zoom technology to bring you near enough to capture distant details. A powerful processor reduces graininess for crisper, higher-quality close-ups. With a 18.2-megapixel Exmor® R CMOS sensor, capture high-resolution images that take full advantage of the camera's high quality Carl Zeiss® lens. Advanced processing technology reduces noise and graininess for incredibly crisp, clear images - even in challenging low-light conditions. WiFi lets you quickly upload photos and videos to social media sites through your WiFi smartphone or tablet, back them up on a network-connected PC, or view them on your compatible large screen TV. Record crystal-clear movies in high-resolution with HD 1080/60i AVCHD™ video capture1. Stunning, fast motion video with reduced distortion looks great when played back on your HDTV2. Notice a perfect photo op while shooting video? With dual record of stills and movies, you can shoot both at the same time. Never miss the perfect shot due to a dead battery. The Cyber-shot WX300 camera features long-lasting, extended battery life so you can capture up to 500 photos on a single charge and shoot nearly all day without a worry. It's perfect for traveling or shooting photos while you're out and about. Sony's Optical SteadyShot™ image stabilization with Active Mode gives you the freedom to shoot movies even while walking or running³. 2-way Active Mode corrects for both vertical and horizontal motion. Explore the full range of features and options below. Enhanced Superior Auto supports scenes with dynamic motion to provide beautiful results even in dark situations. The result is clearer images with less blur. Picture Effect adds a new level of expression to photos, making ordinary landscapes and portraits come to life by heightening mood and emphasizing certain attributes. Beauty Effects allows edits to skin tones, skin smoothing, shine removal, eye widening, and teeth whitening. Beauty Effects can be combined to further enhance the image. Intelligent Sweep Panorama mode takes our Sweep Panorama function to the next level with the addition of motion compensation. Even when subjects are moving in the foreground of your landscape, these cameras can detect faces and moving subjects, intelligently stitching different widths together to minimize distortion. Simply press the shutter button and sweep the camera in the desired direction and the camera continuously shoots at a high speed, then seamlessly stitches the images together with automatic position adjustment to create one stunning panoramic image. Available in wide and up to 360° full circle, the camera can take a variety of panoramic shots. © 2013 Sony Electronics Inc. All rights reserved. Reproduction in whole or in part without written permission is prohibited. Sony, Cyber-shot, SteadyShot, Smile Shutter, Sweep Panorama, Exmor R and the Sony make.believe logo are trademarks of Sony. Microsoft, Windows, and Windows Vista are trademarks of Microsoft Corporation. Mac is a trademark of Apple, Inc. All other trademarks are trademarks of their respective owners. Features and specifications subject to change without notice.